Veterinarians say that there is a strain of dog flu spreading throughout the American West. Health experts and officials in Washington say that almost 90 dogs have been exposed to dog flu, and a dog in Montana tested positive for the strain. While this strain is rarely fatal, it can spread quickly and cause sickness in areas it hasn’t hit hard before. Health officials say that puppies and older dogs are particularly susceptible to the dog flu. A vaccine was made available in November, but some veterinarians say that the vaccine doesn’t fully protect against the latest strain. A few symptoms to watch for are coughing, similar to kennel cough, an uncharacteristic drop in activity level, and a loss of appetite. Most vets tell dog owners to look for any behavior out of the ordinary because the flu can spread easily in places like kennels, vet offices, and dog parks. Most vets are careful to tell dog owners to stay away from dog parks altogether, however, as long as they’re watching for signs of sickness in their dog. If you think your dog is sick with the flu—you’re seeing coughing, a loss of appetite, and vomiting in some cases—take him to the vet right away and avoid contact with other dogs. Humans can’t catch the dog flu, but it can spread easily via close contact with other dogs. 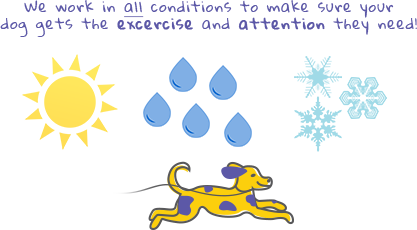 If you’re using or planning to use our dog walking services, let us know if you’ve seen symptoms in your dog. 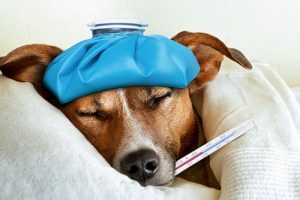 If your dog has had dog flu symptoms, this will affect your dog’s recommended activity level and help avoid the further spread of the virus to the dog population of Fort Collins and the surrounding area. Our professional dog walkers are also trained to recognize symptoms of infectious diseases like the dog flu and can take precautions to avoid exposure to other dogs. The more you can tell us about the symptoms you have found in your dog, the better we can do our jobs and help avoid a massive outbreak and possible pandemic.